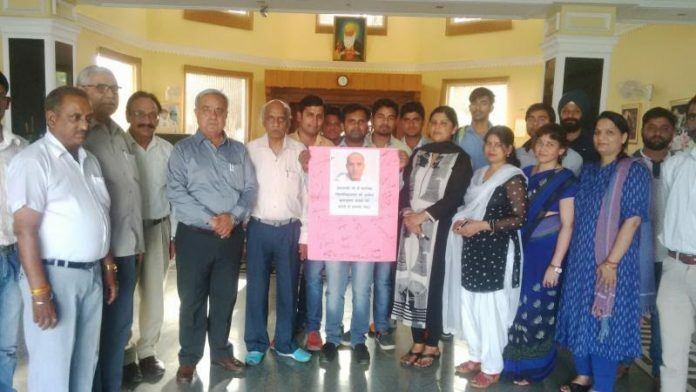 Gurgaon: Starex University, Gurgaon has urged Prime Minister Narendra Modi to save Kulbhushan Sudhir Jadhav from the death penalty. In a letter to Modi, the university has said that there is no proof of any wrongdoing against Jadhav and sentencing him to death is a demonstration of a planned murder. The letter also warns that there will be a sharp ascent in tension amongst Pakistan and India if the former went ahead with the death sentence awarded to Jadhav. Dr. Ashok Diwakar, the Vice Chancellor of Starex University said, “Kulbhushan Jadhav is the son of India, recognized by the Indian government as a former naval officer, and accused by Pakistan of spying. We want justice for him as he is innocent”. Jadav was a serving Indian Naval officer and was undercover in Pakistan as part of his work with RAW. As per Pakistan’s Inter-Services Public Relations (ISPR), Jadav, an Indian RAW agent was living as Hussein Mubarak Patel and was arrested on March 3 near the Pakistan-Afghanistan border of Chaman in Balochistan over unlawful entry into the country. India, however, guarantees that Kulbhushan Jadhav was abducted by Pakistan from Iran. His affirmed association in espionage and sabotage activities against Pakistan led to his arrest. Pakistan Defence Minister Khawaja Asif on Tuesday said that Kulbhushan Jadhav has a right to appeal against his death sentence within 60 days.